"Henry M. Weaver came to Mansfield in 1869 and was one of the founders of the Weaver, Jones & Company, wholesale shoe dealers. The business was liquidated in 1892 and at that time Mr. Weaver became associated with the Barr Cash Carrier Manufacturing Company, which was later merged with the Lamson Manufacturing Company, of Boston, Mass., and Mr. Weaver continued as manager of the company. He was also president of the Mansfield Gas Company." Heritage Pursuit website. There is a patent of 1891 for Henry Weaver assigned to the Barr Cash and Package Carrier Company. There was a law suit between the Barr Company and W.S.Lamson in 1888 regarding a derogatory circular - see Court Cases. Known installations are Barnett's in Bedford, Pa. in 1899; Williams & Norton in Rome, NY in 1900 and The Grand Leader store of McLeansboro, Ill. in 1900. In 1889, the stock of the Barr company was sold to Lamsons (New York Times, 7 Dec. 1889) and Samuel Barr received a large payout. It was "the biggest business transaction of the year" in Mansfield. The name of the company was retained, however, and in 1907 there was a court case against Brooks-Ozan Mercantile Co. at the Supreme Court of Arkansas. 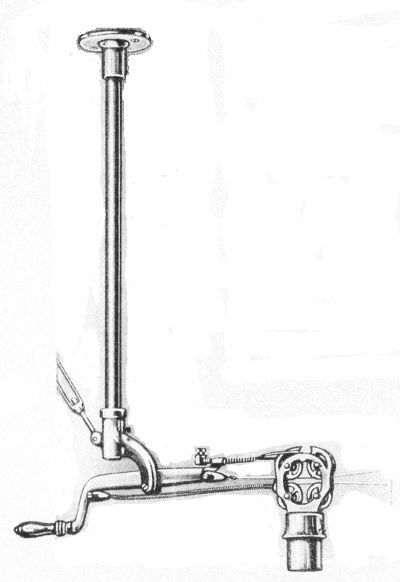 The Barr carrier (later the "Lamson-Barr carrier) was a two-wire system. Pulling down the lever at one end of the line spread the two track wires behind the wheels of the car, so propelling it towards the other end. 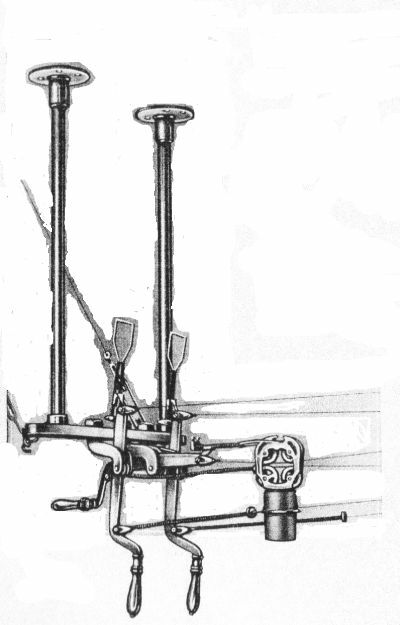 This is the same principle as the Gipe carrier but it also "combined the lever and the wedge." It was further claimed to be unique in that it permits the operator to propel the car at will in either direction. No carrier could compete with it in durability. There were no springs to weaken, no elastics to break and no cords to wear and fray - simply two levers and two wires. The action was practically noiseless. Nor could any carrier compare with it for severe grades because of the continuous propulsive force. Over 30,000 stations of Lamson-Barr cash carriers were in service in the US and Canada in the early 20th century with several thousand more in other parts of the world. There is an illustration of the Lamson "Express" system with somewhat similar cars on the cars page. The complete line with the wires together on the left and spread on the right. A three-line home station with the car on the middle line being "in". On arrival the car is arrested by a coiled spring round the lower wire and is held by a wire retainer at the top to prevent rebounds. A Barr system car, as shown in the drawing above. Unlike the Rapid and Air-Line systems, the whole car, cup and wheels are made of metal. 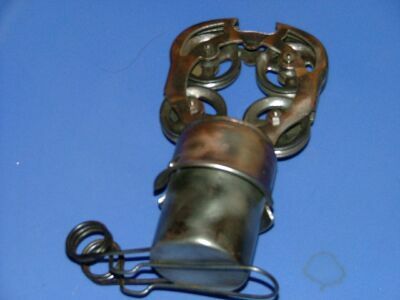 The cup is of stamped steel and if required was fitted with a "message clip" to carry cheques, pass books, etc. The standard finish was oxidized copper but other finishes could be made to order.